Masala Paratha, this is a common dish in North India. But for South Indians, it might look little different. We can try this paratha When we get bored of doing the same usual chapati. This is easy to make as well. Just add the seasoned onion while making chapati dough. After that, making paratha is same as we make chapati. 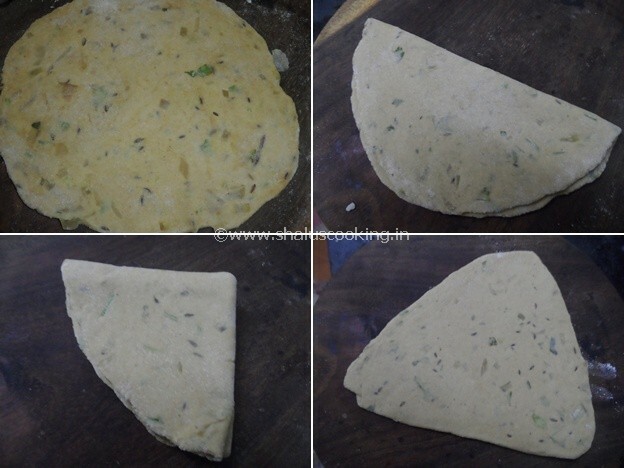 I have made paratha in triangular shape in this recipe, you can make in your preferred shapes. This will be different and tastier than our usual chapati. Goes well with any kind of subzi or side dish we make for chapati. Click Here to view the recipes for Chapati Side Dish. 1. Heat oil in a pan and add the cumin seeds. When the cumin seeds sizzle, add the chopped onions. 2. Saute the onion till transparent. Add chili powder, coriander powder, cumin powder, turmeric powder, amchur powder, garam masala and salt. Saute till the raw smell of masala goes off. 3. Add atta / wheat flour in a mixing bowl, add the onion masala, chopped coriander leaves and little salt. 4. Add water little by little and knead the flour to make soft dough. The consistency should be same as we do for chapati or plain paratha. Set this dough for 15 minutes. After 15 minutes, make medium sized balls out of the dough. 5. Roll the balls to make thin circle. Dust it with little flour and fold it to make a semi circle. Again fold it make triangle shape. Now, roll it make triangle shaped paratha. 6. Heat a tawa and place the rolled paratha ovet it and sprinkle some oil around the sides. Cook on medium flame. 7. Once it is cooked on one side, flip it to the other side. It should be well cooked on both sides and you should be able to see some brown spots over the paratha. Now transfer the paratha to a plate. Easy Masala Paratha is ready to serve. Serve it with any of your preferred side dish.